The researchers found 42 percent of kids have been to the emergency room with a severe food allergy rection. Just under 8 percent of U.S. children have some sort of food allergy, researchers reported Monday. The most common allergies are to peanuts and milk, a new survey found. But 11 percent of parents believed their children had food allergies, a Chicago-based research team reports in the journal Pediatrics. 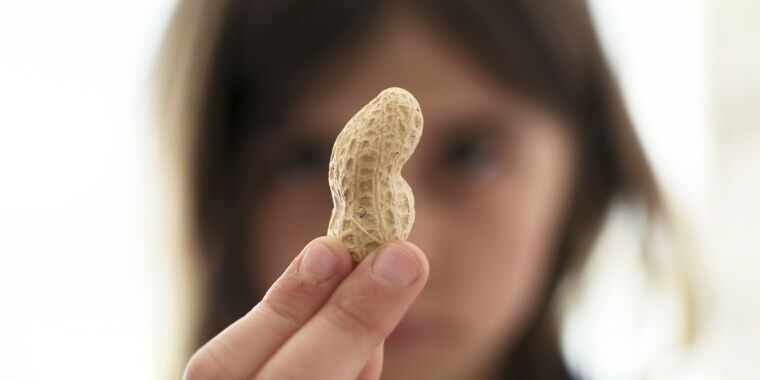 When the children were actually tested for food allergy, only 7.6 percent had true allergies, Dr. Ruchi Gupta of the Northwestern Feinberg School of Medicine and colleagues found. Slightly more than 2 percent of the kids in the survey had peanut allergies, and just under 2 percent had milk allergies, the researchers reported. Another 1.3 percent were allergic to shellfish and 1.2 percent to tree nuts. These are true allergies, not just intolerance. The researchers found 42 percent had been to the emergency room with a severe allergic reaction to something but, worryingly, only 40 percent had a prescription for an EpiPen or other auto-injector to treat severe immune reactions. There are no treatments available to help people avoid severe reactions, called anaphylaxis. But a company working on a treatment to help prevent peanut allergy attacks reported progress. Aimmune Therapeutics said an advanced study of its experimental peanut flour capsule showed it’s possible to desensitize about two-thirds of children with severe allergies. The treatment did not come without risks. Four percent of the kids treated using the capsule had a severe reaction, compared to under 1 percent of those who got a dummy pill, the researchers told a meeting of the American College of Allergy, Asthma & Immunology in Seattle. But 67 percent of the people treated were able to eat 600 mg of peanut protein later, which equates to about two peanut kernels, the Aimmune team reported in the New England Journal of Medicine. This is similar to what Aimmune reported in February in a smaller trial. The company is seeking Food and Drug Administration approval for a product it can offer for sale to the public. Doctors recommend giving babies a little peanut product when they are very small to help prevent peanut allergy from ever developing. It’s not clear what can be done for children with other food allergies, but the study published Monday shows they are common. It found peanut allergy was the most common food allergy affecting kids, with an estimate 1.6 million children having peanut allergy. Milk came in a close second, affecting 1.4 million children, while 1 million kids are allergic to shellfish. The researchers used stricter criteria for this survey compared to a similar survey done in 2011, which also showed about 8 percent of kids had a food allergy. They said had they used the looser criteria from 2011, it would have shown a growing number of children with food allergies.